There was not nearly enough Harry Houdini in this book! And in saying not enough, I mean , other than a mention, none! Outrage! 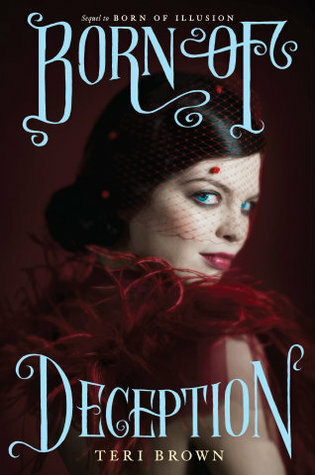 Anyway, Born of Deception was an excellent second book in the Born of Illusion series. There was danger, excitement, jealousy, passion, and a cute cowboy with piercing blue eyes- everything a cheeky and great book of the 1920's should be. I will be honest, this book didn't shock me- I had it figured out by the first quarter of the book. That being said, getting there and seeing how Anna was making stupid mistakes was pretty entertaining. I am so glad that things didn't turn out the way I expected between Cole and Anna (and something else I can't talk about). Such a relief. There wasn't as much magic in the show. And by saying that I mean, there was plenty of magic, but a majority of it was done off of a stage. All in all this was a solid book. (And one that had me so absorbed that I was convinced that when a hockey player called called out for possession on TV- I was convinced he was taken over by a ghost- oops.) It didn't shine as much as the first book *coughcoughHarryHoudinicoughcough* but I am hoping that will be fixed for the next book *coughcoughIrepeatHarryHoudinicoughcough*.